Brexit is short for “British exit” – and is the word people use to talk about the United Kingdom’s decision to leave the EU (European Union). The Leave side won by nearly 52% to 48% – 17.4m votes to 16.1m – but the exit didn’t happen straight away. It’s due to take place on 29 March 2019. That means that if the withdrawal agreement gets the green light, there will be no huge changes between 29 March 2019 and 31 December 2020. This is the political declaration. However, neither side has to stick exactly to what it says – it is a set of ambitions for the future talks. 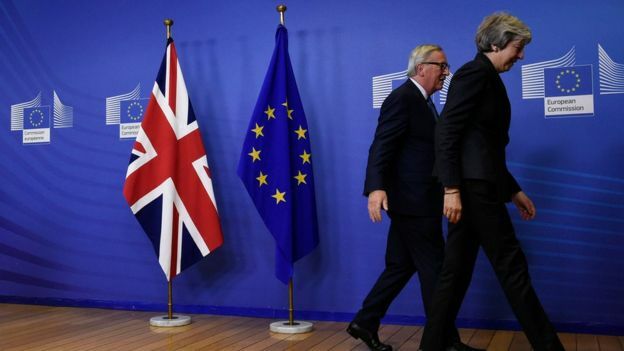 The deal was agreed by the UK and the EU in November 2018, but it also has to be agreed by British MPs – and they have so far voted against it. How did MPs vote on the withdrawal agreement? They voted overwhelmingly to reject the deal on 15 January by 432 votes to 202 – a huge defeat. Prime Minister Theresa May is talking to the EU in an attempt to get some changes to her Brexit deal. This comes after MPs put forward some suggestions to try to change the direction of Brexit. It means Mrs May is now focused on sorting out a row over Irish border arrangements. The problem? The EU says it has already negotiated a deal. Mrs May has said MPs will be able to have a second vote on a Brexit deal by 12 March. If MPs reject her deal again, they will be asked to vote on whether they would like to leave the EU without a deal instead (they are expected to say no to this). If they do say no, Mrs May will ask MPs to vote on whether the leaving date of the 29 March should be pushed back. Mrs May has said the latest it would go to is the end of June and that would “almost certainly” be a one-off. So will the UK definitely leave on 29 March 2019? It is written into law that the UK will be leaving on that date at 11pm UK time. But it is impossible to say with any certainty what will happen next. The deadline of 29 March could definitely be extended, though. As explained earlier, MPs could be given the choice to vote on whether to delay this date if they vote neither to accept Mrs May’s deal nor to exit without a deal. But what happens if they do vote for a delay is not yet clear. Mrs May said it wouldn’t make getting a deal “any easier” – and that the choices would still be “leave with a deal, leave with no deal, or have no Brexit”. Meanwhile, the European Court of Justice has said the UK could even cancel Brexit altogether without the agreement of other nations. Mrs May, however, says she “shall not” do that. “No deal” means the UK would have failed to agree a withdrawal agreement. That would mean there would be no transition period after 29 March 2019, and EU laws would stop applying to the UK immediately. The government says it is preparing for this potential situation, but there is “little evidence” that businesses are. It expects some food prices could rise and checks at customs could cost businesses billions of pounds. It has published a series of guides – which cover everything from pet passports to the impact on electricity supplies.